Easily track your customer service requests! NewWaySERVICE, work order management application. NewWaySERVICE allows you to track and manage your work orders no matter your field of activity. In effect, NewWaySERVICE allows you to manage any types of requests such as repair, maintenance, support or information requests. Some words from happy users. "The Work Order system is the best I've seen after reviewing dozens of Service Management software products." "You rock! NewWaySERVICE is way above the maintenance work order systems that are out there. Moreover, it is affordable for small businesses." 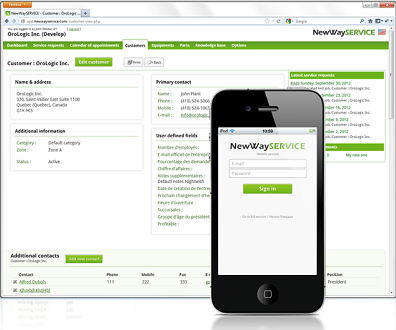 NewWaySERVICE is a cloud web application. You can access and manage work orders in NewWaySERVICE from a desktop computer, a tablet or a smartphone. NewWaySERVICE is always available, 24 hours a day, 7 days a week. You have nothing to install on your side. A simple internet connection is enough to use NewWaySERVICE. In addition to manage your work orders, NewWaySERVICE allows you to schedule appointments for your technicians, manage equipment, setup recursive work orders (for preventive maintenance purpose) and a lot more. Your technicians in the field can even directly update their work orders or capture customer signature using their smartphone. We invite you to visit the official website of NewWaySERVICE at www.NewWaySERVICE.com for more information about this application or to simply try it absolutely free.